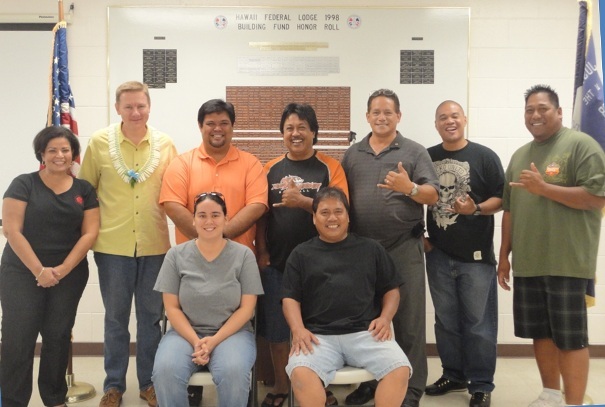 Winpisinger Center Director Chris Wagoner, standing, second from left, held a special onsite Negotiation Preparation for Bargaining Committee class for the Local 1998 Negotiating Committee in Hawaii. From left, standing, Maria Santiago Lillis, Chris Wagoner, Josh Elmore, Rex Baccay, Billy Panui, Mario Castro and Don Barlan. Seated from left: Cynthia Gallagher and Oscar Reyes. The Local Lodge 1998 negotiating committee is preparing to negotiate a second contract with BAE Systems at Schofield Barracks in Hawaii with onsite training by IAM William W. Winpisinger Center Director Chris Wagoner. Wagoner conducted the Center’s popular Negotiation Preparation for Bargaining Committee at Local Lodge 1998. The course included developing a collective bargaining strategy, strategic planning and costing, communication and surveys and reviewing the Service Contract Act and labor law. Wagoner provided the majority of the course instruction, but with the use of Skype participants also received instruction from David White from Strategic Resources, Bill Haller from Legal and Damien Anderson from the IAM National Pension Fund. “Our strength is always in our members and their level of empowerment. Brother Wagoner did an excellent job of solidifying the team and familiarizing them with the tools they will use for successful negotiations,” said Maria Santiago Lillis, Grand Lodge Representative for the Western Territory. Negotiations have been tentatively scheduled to begin in January 2013. The current contract expires February 28, 2013.